Cologne, Germany, 2018-May-16 — /Travel PR News/ — From now on, Lufthansa Business Class passengers on long-haul flights to and from South Africa, Latin and South America and the West Coast of the USA can enjoy an even more relaxed night’s sleep. The Lufthansa Dream Collection makes it possible! In addition to a new pillowcase and a large, warm blanket, a comfortable mattress topper makes for beautiful dreams. In addition, our passengers can make themselves comfortable on night flights with the new sleep shirt from Van Laack. The soft and padded mattress topper was developed especially for Lufthansa in cooperation with the renowned German bed manufacturer “Paradies”. While the upper side is made of 100 percent cotton, the underside is made of non-slip terry cloth. This enables an ideal air exchange, which prevents strong heat accumulation. A similarly soft filling is provided by the new blanket and pillow, which provide pleasant warmth and comfort. 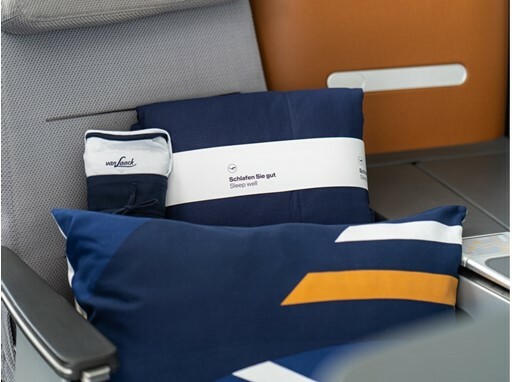 Both the blanket and the pillowcase are designed in Lufthansa’s new brand design. Since Lufthansa is also setting standards in terms of environmental friendliness, the plastic packaging of the blanket was replaced by a paper banderole. This entry was posted in Airlines, Business, Flights, Travel Services, Travelers and tagged Business-Class, Dream Collection, lufthansa, Paradies, Van Laack. Bookmark the permalink.